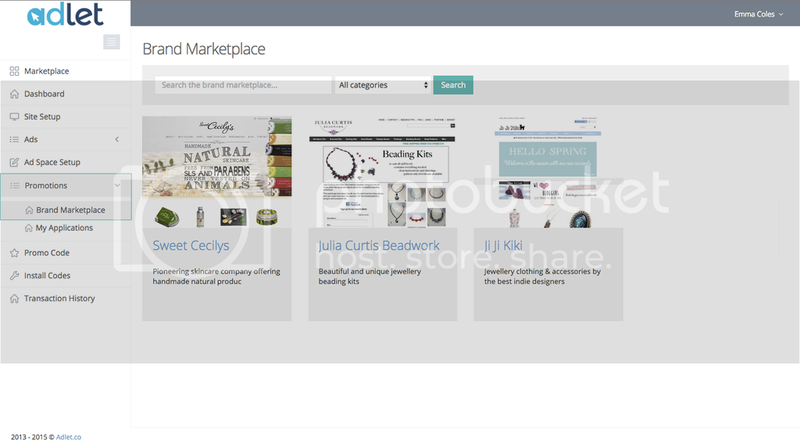 A shiny new feature for Adlet is the Brands Marketplace and Promotions. If you love trying new products and writing reviews on your blog, you’re going to love this! In the Brands Marketplace you can browse all companies that currently have collaboration opportunities (Promotions). This guide takes you through creating and setting up your blogger account and how to apply for Promotions. If you already have an account and your Profile setup, skip to step 3. 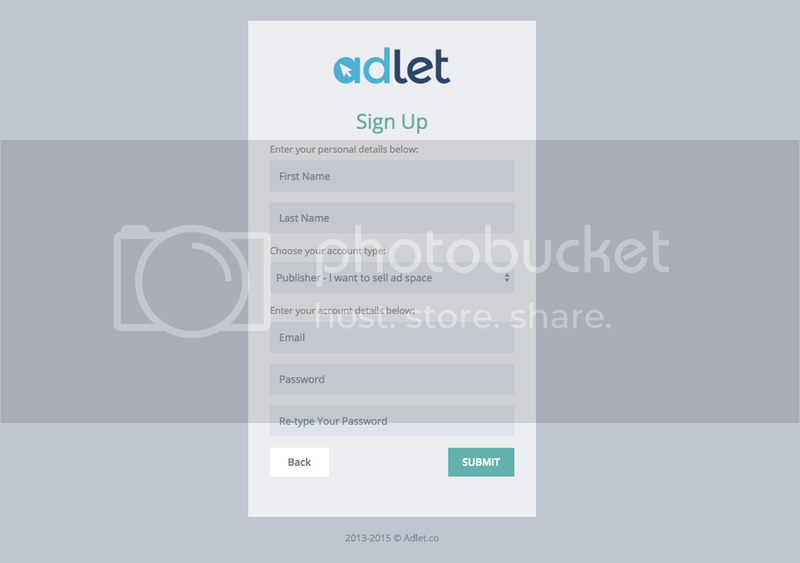 If you haven’t already, you will need to create an Adlet account (don’t worry, it’s free!) Fill in your name, email (this will be your login) and choose a password. Make sure you pick the ‘Publisher’ option. 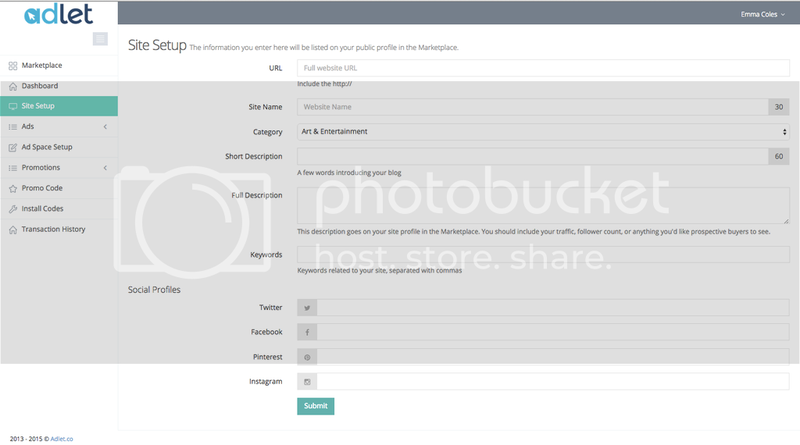 Set up your blog profile-enter your URL and site name and select the category most appropriate. In the description include any important information you want brands (and potential advertisers) to know about (e.g what your blog is about, the types of brands/advertisers you’d like to work with, your follower numbers). Add relevant keywords and social media links and then click Submit. To view all open Promotions click Promotions -> Brand Marketplace on the left-hand navigation. The Brand Marketplace contains all of the companies that currently have open Promotions and collaboration opportunities. Click on the Brand Profile to see their current Promotions. 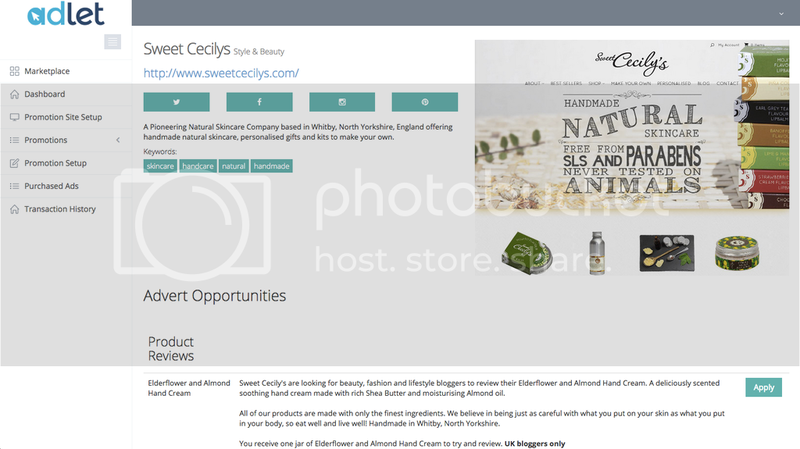 The example above shows that Sweet Cecily’s currently has a Product Review Promotion to try some of their Elderflower and Almond hand cream. The information explains what the product is, what you will receive and what they would like you to do/write. To view more information and apply to the Promotion, click on the Apply button. 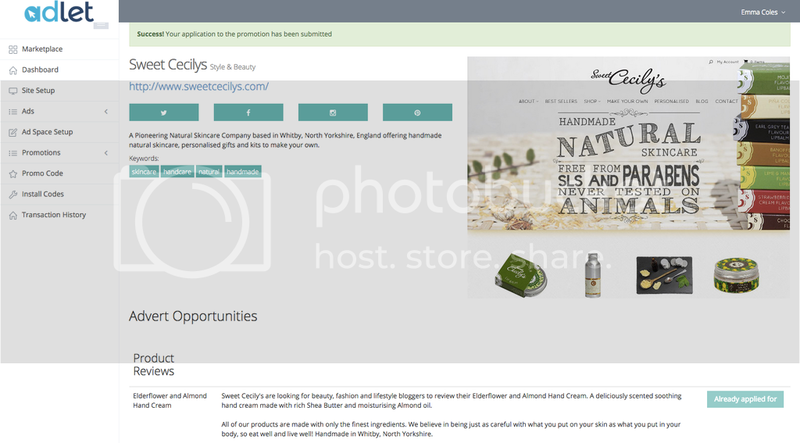 The next page contains the Promotion information, a picture of the product and the application form. Make sure the correct site is selected on the dropdown and fill in the Pitch box. Your Pitch will help the brand decide which bloggers they would like to work with on this promotion. 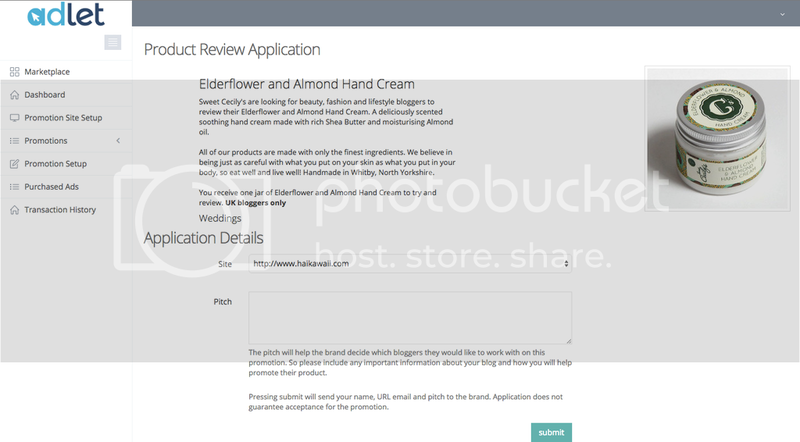 Include any important information about your blog and how you will help promote their product. You will receive an email to say that your application has been received and we will let you know if you have been accepted. You can view all of the Promotions that you have applied for by going to Promotions -> My Applications in you account. If you have any questions, don’t hesitate to send us an email or Tweet. We’d love to hear what you think of the brands we are currently working with and who you’d love to work with in the future!